The ultimate resource for making the most out of your home and living a fabulously stylish existence, an Elle Decoration magazine subscription is the ideal read for anyone who loves to know the latest interior trends, take sneak peeks inside beautiful homes and find living and lifestyle advice for the busy modern household. Featuring the latest stunning collections from your favourite household brands (plus up and coming names you may not have caught on your radar yet), there’s plenty of home inspiration in every issue! Make your house a beautiful home with an Elle Decoration magazine subscription today! Know a house-proud friend who loves nothing more than talking interiors? Why not treat them to an Elle Decoration magazine gift subscription? 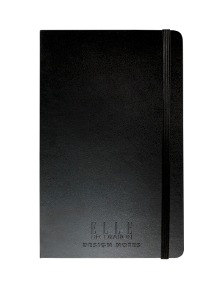 FREE GIFT - Moleskine notebook worth £17.99 with your subscription! Taking inspiration from art, culture, the seasons, fashion and more, an Elle Decoration magazine subscription is full of beautiful rooms, living spaces and homes to inspire you for your next decorating project. With hues, colours, textiles, textures and shapes that’ll transform any space, the Elle Decoration team curate a fashionable edit of all the trending homewares and styles you need to know about. With an Elle Decoration magazine subscription, you’ll find each glossy delivery full to the brim with great advice. If you ever wondered how to make the most of a south facing window, create space for a pantry or how to make a guest room feel more welcoming, there’s plenty to discover in every issue! Free delivery, direct to your door! How much is Elle Decoration magazine? How often is Elle Decoration magazine published? How can I buy Elle Decoration magazine? How many issues of Elle Decoration magazine are published each year? Who publishes Elle Decoration magazine?